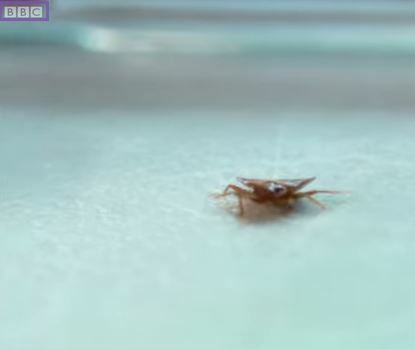 We've been back from the UK for almost a month now, but we are still drawn to all things British--like this bed bug video from the BBC! Unlike in this very clean and safe laboratory, if you have one bed bug, you probably have many, many more. Do you wake up with itchy welts? Do you see blood spots on your sheets? Your problem is not going to get better if you ignore it. Inspect carefully for bed bug eggs and not just your bed. Bed bugs hide in any tiny crack or seam, in bedside table drawers, behind pictures and mirrors, in other upholstered furniture. They hide during the day when you are looking for them, and come out at night drawn by your exhaled carbon dioxide. What is the best way to treat bed bugs? We've got it--heat! Raising the temperature of your room, home, or apartment to 130 degrees for an extended period will kill all bed bugs: eggs, nymphs and breeding adults. Heat is the only way to get them all and does not leave any dangerous chemical residue or make you move out for days on end. Bed bugs are annoying, disturbing, even anxiety-producing, but they are definitely treatable. Call Alliance in California for heat treatment of your bed bug infestation! We can't do anything about that English accent, though. That's up to you!